Who would have thought that only a few short months ago I would be paddling across the Klamath River in my own little rubber raft to my sluicing and dredging operation. Particularly since when my husband, Little Tony, first presented me with, “Let’s go for the gold,” I thought he had completely gone off the deep end! He tried to indoctrinate me by placing treasure and gold mining magazines on my night stand; the stack getting so high I couldn’t see the alarm clock, which needed to be set to make sure I got up in time to go to work. Being the curious, adventuresome person I am, Tony didn’t have to do too much fast-talking to get me to agree to give it a try. My feelings were that I could always go home. We quickly prepared for our adventure, shopping for what looked liked a year’s provisions. Three of our sons, Tim 18, Ron 16, and Robert 13 and family pets Willy, Muffin and Treasure, were all packed. The caravan was ready to go. 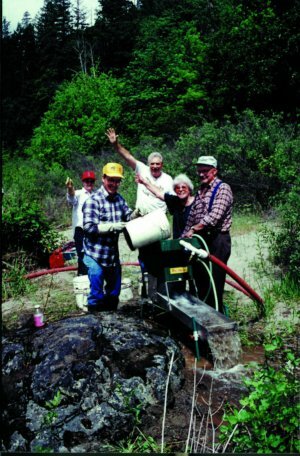 Shortly after our arrival into Gold Country, I was anxious and full of enthusiasm, ready to learn what I needed to know about gold mining, which prompted me to enroll in a Gold Dredging Workshop”, being put on by Dave McCracken, founder of The New 49’ers Prospecting Group. I must say, I quickly met head on with my first challenge. Half way through the training program, we were to have lessons in diving underwater in the river. After a short 15 minute deep water dredging lesson with mask, regulator, wet suit and 65 pounds of lead weights strapped around my waist, I bravely descended into the river following my leader into the 14-foot dredging hole. Within minutes, I knew I was out of my element. I couldn’t breathe as my face mask and regulator filled with water. Forgetting all my topside instruction, weights and all, I headed for the water’s surface, as I knew I was going to drown. Luckily, the training program included capable helpers who were right there to help me out. Nothing short of a fist fight would have gotten me back down into that hole! Thus ending my career as a deep water dredger. However, Dave did tell me I was very brave. That made me feel a little better. Now, you have to understand, I have always preferred being a participant rather than a spectator. There was no way I was going to spend the entire summer on the riverbank safely reading the many treasure magazines that somehow seemed to have found a place in the camper conveniently on my side of the bed. 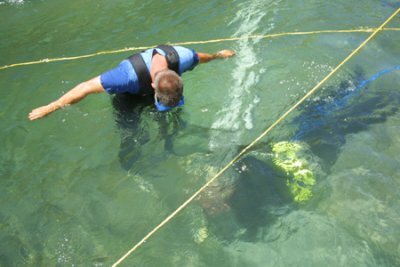 A few days after my underwater experience, there was a rumor in camp that “Highbanker Bob” might have his successful sluicing & dredging equipment for sale. 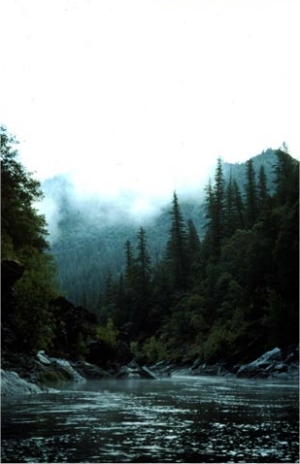 Thus began my friendship with Bob and my love affair with the Klamath River and surface sluicing. No longer caring what time it is, as that seems so unimportant here on the river, I fill my thermos, fix a lunch, hop into my swim suit, shorts, and soggy tennies, still wet from the day before. After asking my partners Willy and Muffin (whose percentage is what a dog’s should be), “Are you ready to go to work?” with a wag of their tails and barks, they agree it is time to leave. We head up the road to the “Mega Hole“, where the river and raft are patiently waiting for us. Forgetting all troubles and worldly affairs, I quickly prepare to make the raft trip across the river. Donning my wet suit top and stowing a gas can, my trusty bag that holds lunch, treasures and supplies, then telling my partners to jump into the bow of the raft, with a little shove, I quickly jump in the stern and we’re off! Forgetting my past fears of the river, I begin to paddle slightly up stream so the current can help bring us to our cross-river destination. 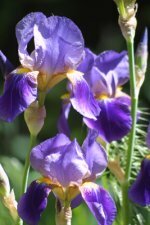 Upon arriving, I eagerly prepare for the day’s work, anxious to know what treasures lie hidden beneath the rocks and dirt, hoping to recover a few. Not being a mechanic, I am very thankful when the engine to my portable water pump starts with the first pull of the cord. I welcome the purr of the engine, as it is pumping the water through the maze of hoses to my sluice box. Sometimes, I shovel dirt into the sluice box. But I usually prefer the dredging method, allowing more material to wash through the sluice box. This is where the water pump powers a small dredging unit that I use in shallow pools of water up on the stream bank. The material I dredge is directed through a hose into the sluice box. More often than not, I find myself daydreaming, enjoying the sun’s rays on my body, not caring that I have mountains of rocks to move, many of which find their way into my pockets. I Often have to remind my partners they are not doing their share of the work. They are too busy chasing toads and dragonflies, and occasionally startling a rattlesnake, one of which bit Willy on his muzzle and chest. Fortunately on that day, Ron and Robert were helping me. They killed the rattler with my mining shovels, Robert proudly showing his trophy of nine buttons. I bravely buried the snake’s head and body in separate holes, as I was told this was the proper thing to do. Needless to say, I thought this would end my friendship with Willy and his mining career. However, being the macho poodle he is, he survived the bite and has gained the respect of his fellow miners. This was a good lesson, as he is now more cautious, watching carefully for any movement, often letting me know of any other snake’s presence. Occasionally, a nosey bear comes wandering out of the woods, only to make a hasty retreat with Willy and Muffin in close pursuit. Judging from the sinking sun and my sore aching body, I realize it is time to clean up the sluice and get a closer look at the gold I recovered. For me, this is the highlight of the day. I carefully pan the concentrates, soon revealing my finds for the day, hoping that perhaps today I will top my all-time high of 83 beautiful flakes of gold. The greatest thrill was finding not one, but two, nice gold nuggets in one day. I soon realized I don’t have gold fever; because the nugget I prize as the most, is a tiny quartz nugget nestled inside a lacy gold flake. 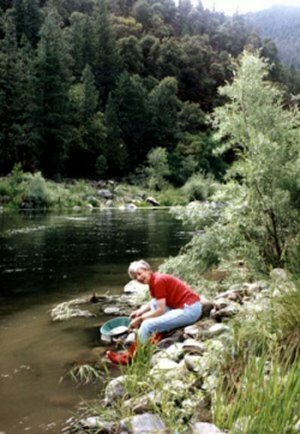 I am proud to say there has not been a day that I have not found gold sluicing along the Klamath River. I experience a great “high” when I see the color in my pan. I know personally each flake of gold that I carefully place in the one-ounce glass vial, filling it ever so slowly. One day, when the vial is full, I will have reached a goal I set for myself with mixed emotions, realistically knowing some of the gold will have to be sold. After having the day’s treasure finds placed safely in my bag, some of which are old square nails encrusted with rust and rocks, I get a welcome reminder from the Blue Heron telling me it is time to go home. He has allowed us to intrude on his domain as long as he cares to. With the sun quickly fading, I take a last look around, drinking in the beauty and serenity of the forest and the rushing river. Happily, we head for the raft, feeling good about our day’s accomplishment. When I begin to quickly paddle the raft that will safely get us back across on shore, I can’t help but chuckle when I remember my first attempt at paddling back across the river and going nowhere but in circles. Oh, how far I have come in a short period of time! Regardless of the varied backgrounds of all the gold miners, we have a common bond that has brought us together. Gold! I know when the time comes to make the return trip home, I will not only take my treasures of gold, rocks, nails and such, but the feeling of richness from having made new friends, remembering the shared stories, poems, music, food and all the laughter. 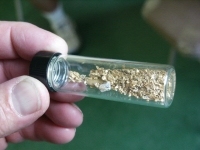 All of this I will take home, looking forward to next year’s gold mining season. I will no longer be a greenhorn but a seasoned miner who has paid her dues.